was announced! As the last ten seconds were counted down, the hairy Twits Captain – Daniel Francis – scored with the final score Twits – 4 goals vs Philosophers – 3 goals. How different it could have been!! If only Eve had not lost her side a penalty point by surreptitiously moving her team’s goal ‘posts’ closer together. (Shame Eve!) If only Hannah’s mother had not placed her five year daughter in the goal square for a ball to whack and bounce away. (Nice one, Graziela!) Such are the fortunes of war. There was a weeping and gnashing of moustaches but fortunately there were plenty of knotted handkerchiefs to wipe the tears away. Never mind – ‘revenge shall be mineth saith the Lord’ in 2013. 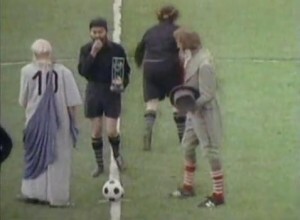 Yes, 2012 was the third year of the sensational Monty Python Annual Soccer Match. Last year it was played at the Port Melbourne Trugo Club with a narrow victory by the Twits (I think). Don’t miss next years re-match or ‘REVENGE OF THE TWITS’. Order of proceedings: Arrive at the park at 2.30pm to be allocated with identifying markers to the Twit or Philosopher teams depending on assessed intelligence or irrelevance.. Match starts at 3.00pm with two ten minutes halves. Ambulances will be on standby. We have afternoon tea at 3.30pm and ask people to bring a plate to share on the lawn and a blanket/chair (optiona). No RSVP. Just turn up on time ready to play the match of your life. Start practicing silly running. See training videos below. VIEW OUR TRAINING VIDEOS ON YOUTUBE !!! The Inaugural Monty Python Cup took place on Saturday 15th May 2010 in Fawkner Park. The Philosophers and Twits are well known to Monty Python fans but this was the first time in history that Philosophers had played against Twits. The match due to start at 2.00pm began promptly at 2.45. Eve allocated the teams and uniforms. 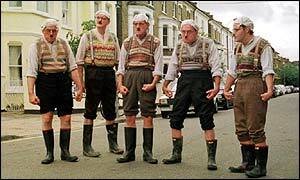 Twits were resplendent in the traditional handkerchief on their heads with four knotted corners. Philosophers played with diplomas tied to them with bright red ribbon, they also wore stick-on moustaches, goatees and sideburns. The Philosophers seized the initiative in the first half driving down the flanks with Max on the right and Daniel on the left ably supported in the midfield by Mark, Joe, and Ruth with Margaret and Sidney bringing up the rear. Twit goalie Jonno ably deflected innumerable balls. So many balls missed that Jonno introduced the IYKIOYCBWGIYR rule (If you kick it out you can bloody well get it yourself). 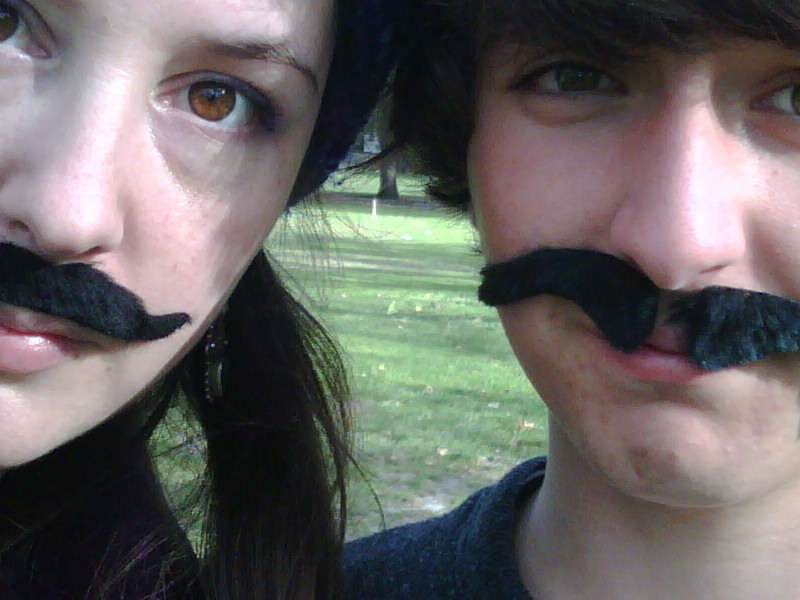 This led to Max and Joe disappearing for long periods on the horizon. However Philosopher Max (13) was unstoppable kicking two goals within ten minutes. Jubilation amongst the Philosophers! Janet of the Twits unsuccessfully lodged a formal protest that no one under 15 should be allowed to play. Now the Twits realised defeat was staring them in the face and launched a spirited counter attack with David ‘Griffo’ and Meyer kicking from the back to midfielders Janet, Julie and Julia who pressed it forward to striker Fay Ginsberg who kicked a stunning goal which was vacant while the Philosopher goalie Amanda had left to fetch her dog. The Twits were jubilant. The no–touch rule was invoked when Meyer lifted up Fay several times shouting Ginsberg! Ginsberg! Ginsberg! Now the game really heated up as both sides realised the next goal was decisive. Passerbys watched curiously but soon moved on, not understanding the rules or concerned that players might be dangerous. 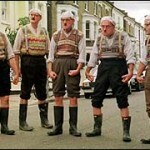 A howl of protest was raised by the Twits when it was discovered umpire Nick was actually playing for the Philosophers. He resigned the position to Neal and then played on the back line for the Twits. Neal stated his only rule was ‘I love power’. The Twits pressed forward desperately with the war cry ‘One More Goal! Twits Janet, Julia and Fay engaged in a titanic midfield tussle with Philosophers Sidney, Joe, Ruth and Margaret. Meyer moved forward and balls rained into the goal but Philosopher goalie Amanda deflected three balls in a row shouting ‘Back off Eidelson!’ to her beloved partner. The first injury occurred as Jonno went into cramp but he was ably assisted with unconditional positive regard by three social workers, one psychiatrist, one psycho dramatist and a complementary therapist all playing on the field. Oma, Catherine and Sam (14) arrived on the field after getting lost on a Burke and Wills trek in the park leading to a bidding war for Sam’s services as a famous soccer player. He generously agreed to play for both sides. However exhaustion set in and a short break was called for food, libation and cake. However this proved so popular that the match never resumed. The final score: Philosophers 2, Twits 1. Players were interviewed about their strategies. Twits player Fay said: I’m happy; I kicked a goal in the only soccer match I’ve ever played. Philosopher player Margaret commented: What happened? What team was I on? Which direction was I kicking? Meyer declared The Philosophers as the inaugural winners of the Monty Python Cup. Nick declared the Monty Python Cup to be an annual event.